Do you have 100 pages of script but only 50 pages of story? That's the single biggest reason scripts are rejected in Hollywood. I'm John Truby. I've taught advanced story structure to over 30,000 people worldwide, including the writers, directors, or producers of Shrek, Planet of the Apes, Flamingo Rising, The Negotiator, Inspector Gadget, Outbreak, Sleepless in Seattle, The Addams Family, Beetlejuice, Nightmare on Elm Street, Scream, Kiss of the Spider Woman, Back to School, Rambling Rose, Star Wars and many more, and have been story consultant on over 1000 scripts. I've seen all the story problems and I know how to fix them. TO A GREAT STORY ONLY $179 SPECIAL!!! Truby's BLOCKBUSTER puts over 300 professional techniques at your fingertips to help you create a great story, in a fraction of the usual time and effort. Don't believe that's possible from a software program? Try it. You'll write your best script ever. 1. Blockbuster's Premise and Genre screens show you the 'gold' of your idea and which genre forms are best for expressing it. 2. Character Web, World, and Arc screens help you create complex characters that grow over the course of the story and move the reader. 3. The Plot screen takes you through the 22 Building Blocks of every great story, giving you a surprising plot that builds steadily from beginning to end. 4. Blockbuster's 'drag and drop' Scene List shows you the right structural order for your scenes, and lets you figure out the ideal sequence in a fraction of the time. 5. Rewrite shows you the deep structural weaknesses that are likely to be in your script and takes you through the ideal order for fixing them. 6. The most extensive Coach system for writers ever created, including my complete Story Structure Course, the 103 Greatest Characters in fiction, 8 key Story Shapes, 23 greatest Story Techniques, and over 65 online Story Examples.  Premise tells you whether your idea has depth, staying power and originality, then shows you how to develop it.  Genre tells you the one or two story forms best suited to express your idea.  7 Keys gives you the nucleus on which your ideal story structure will be based.  Rewrite shows you the problems in your script, then helps you fix them.  32 Blockbuster Story Examples including Jurassic Park, Star Wars, Forrest Gump, Home Alone, and The Godfather, show you how master storytellers solved the story problems you are facing.  Truby's complete Story Structure Class (a $200 value) online at the click of a button John Truby has coached 30,000 writers around the world, including the authors of The Mask of Zorro, The Negotiator, Outbreak, Back to School, Nightmare on Elm Street, Beetlejuice, The Addams Family, Kiss of the Spider Woman and Sleepless in Seattle. Now you can get the advantage they've been using for years. � Has an additional 100 techniques, to give you the largest collection of story tools ever assembled in one place. In your computer. � Helps you find what is truly original in your story and execute it professionally. � Connects all the story elements under the surface in a seamless whole. � 14 major help areas to explain every aspect of the storytelling craft. � Over 100 story examples on screen and online to solve any story problem you might encounter. � 8 story shapes to show you how to build the perfect plot for your unique idea. � Totally redesigned interface that's quick, productive and easy. � Horizontal ribbons for fewer clicks to all screens. � Navigation tree shows every beat in your story in one view. � Larger screen area so you have more room to work. � Galleries for easy-to-make choices of all your story elements. and MUST BE PURCHASED SEPARATELY). "This guy is the best script doctor in the movie industry, and this program makes you tell a good story whether you want to or not. A winner. If you even toy with the idea of storytelling, you must have this product. Highly recommended." "Blockbuster is an ingenious and multilevel guide through the maze of story organization... way ahead of any other writing tool I know of." " I think of all of them Truby's the best. I actually use Blockbuster, because I think he's really good. For my taste, his stuff cuts the deepest, and allows you to develop the most detailed structure and outline." "Blockbuster is all that it is advertised to be, a virtual screenwriting school, and a great one at that." "As a result of Blockbuster, I won a Gold Award at the Charleston Film Festival, and a Bronze Award at the Houston Film Festival in the Comedy category." "My pleasure to let you know an agent has picked up three of my screenplays. All were written by the guidelines of Blockbuster." "Among the legions of screenplay guru devotees, few would deny that John Truby is the most cutting edge of the lot. 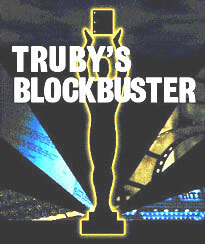 For success, Truby and his software is a match made in screenwriting heaven... No, Blockbuster will not solve all of writing's perennial ills, but it does bring the cure several giant steps closer." John Truby has brought his screenwriting expertise to more than 30,000 students, teaching the art form all over the world. Now he's bundled his critically acclaimed approach to story writing into a complete screenwriting program. Truby's Blockbuster program walks you through the intricacies of storytelling, allowing you to learn as your write. "Among the legions of screenplay guru devotees, few would deny that John Truby is the most cutting edge of the lot. For success, Truby and his software program is a match made in screenwriting heaven..."
Truby's Blockbuster software is the only one of its kind tailored to each specific genre. Action screenwriters are taught how to write for action movies, and comics for comedies. From the horror screenwriting program to software for love stories, sitcoms and science fiction, each Blockbuster program is geared directly toward the genre itself. John Truby's Blockbuster screenwriting program focuses on the philosophy of writing the story. The program takes users through the complexities of character development, the structural order of individual scenes and Truby's 22 building blocks of every great story. Blockbuster is by no means a "paint by numbers" approach to storytelling. Truby's screenwriting program teaches writers how to turn original ideas into completely developed storylines fit for the big screen.